Square of territory 45sq m.
In 1507 in documents called Oshpykiv. 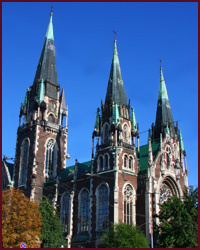 Potocki was Shpykiv property. Then through Octavia - daughter Potocki, Shpykiv became the property Sveykovskyh kind. Grandson of Octavia in 1865 sold Shpykiv to cadet Balashov. Looking at the lithographs of Napoleon Orda, disappointed in a modern castle-palace is very easy. 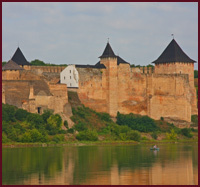 Castle Palace was built by Potocki times. Due to local topography had a lock and two floors. 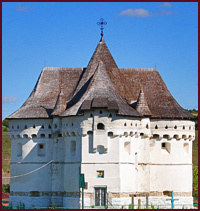 All buildings facing the courtyard of the castle are a floor, but overgate tower. Above the tower spire once exalted. On the side facing the lake, thrown inside the empty room. Not far from the castle building in eclectic style - house estate agent, built the project Gorodetsky. 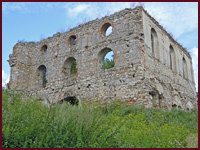 Ruins of sugar factory are inn 200 meters from the castle. This factory was built in 1844!